Geofencing is a feature in a software program that uses the global positioning system to define geographical boundaries. Combining a user position with a geofence perimeter, it is possible to know if the user is inside or outside the geofence or even if he is exiting or entering the area. Geofence API is part of Google's Location APIs. It includes Geofence, GeofencingRequest, GeofenceApi, GeofencingEvent, and GeofenceStatusCodes. Geofence is an interface that represents a geographical area that should be monitored. It is created by using the Geofence.Builder. During its creation, you set the monitored region, the geofence's expiration date, responsiveness, an identifier, and the kind of transitions that it should be looking for. GEOFENCE_TRANSITION_ENTER indicates when the user enters the monitored region. GEOFENCE_TRANSITION_EXIT indicates when the user exits the region. 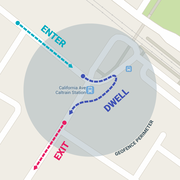 GEOFENCE_TRANSITION_DWELL indicates that the user entered the area and spent some time there. It is useful to avoid multiple alerts when the user is entering and exiting the area too fast. You can configure the dwelling time using the setLoiteringDelay parameter. The GeofencingRequest class receives the geofences that should be monitored. You can create an instance by using a Builder, passing a Geofence or a List<Geofence>, and the kind of notification to trigger when the geofence(s) is created. The GeofencingApi class is the entry point for all interactions with Google's geofencing API. It is part of the Location APIs and it depends on a GoogleApiClient to work. You will use the GeofencingApi to add and remove geofences. To add a geofence, you call the addGeofence() method. It monitors the given area using the settings passed to the GeofencingRequest and shoots a PendingIntent when a geofence transition, entering or exiting the area, takes place. To remove the geofence, you call removeGeofences(). You can either remove the geofence using its request identifier or its pending intent. In this tutorial, we create a simple application that monitors the user location and posts a notification when the user enters or exits a geofenced area. The app consists of only one Activity and an IntentService. We also take a quick look at GoogleMap, GoogleApiClient, and FusedLocationProviderApi, and we explore some caveats of the geofence API. Also, geofencing needs Google Services API. Open your build.gradle and add the dependency. Our project will consist of one layout, the MainActity layout. It contains the device's current latitude and longitude, and a GoogleMap fragment that displays the geofences and the user's position. Since we are using a MapFragment, we need to set up and initialize a GoogleMap instance. First, you need to obtain an API key. Once you have an API key, add it to the project's manifest. Following is steps that describe logic of our application. After that you can see full code. Let's begin with the GoogleMap instance. Implement GoogleMap.OnMapReadyCallback, GoogleMap.OnMapClickListener, and GoogleMap.OnMarkerClickListener in the Activity class and initialize the map. To use the GeofencingApi interface, we need a GoogleApiClient entry point. It will responsible for GoogleApiClient.ConnectionCallbacks and GoogleApiClient.OnConnectionFailedListener callbaks. We also need to access the user's current location. The FusedLocationProviderApi interface gives us this information and allows a great level of control of the location request. This is very important, considering that location requests have a direct effect over the device's battery consumption. Next step is implementing a LocationListener. Check if the user gave the application the appropriate permissions by creating the Location request and display their current location on the screen. It is important to address that created LocationRequest isn't optimized for a production environment. The UPDATE_INTERVAL is too short and would consume too much battery power. A more realistic configuration for production could be: UPDATE_INTERVAL = 3 * 60 * 1000, FASTEST_INTERVAL = 30 * 1000. Our Activity needs two different markers. A locationMarker uses the latitude and longitude given by the FusedLocationProviderApi to inform the device's current location. A geoFenceMarker is the target for the geofence creation as it uses the last touch given on the map to retrieve its position. At last, it is time to create a geofence and create the GeofencingRequest object. We use the geoFenceMarker as the center point for the geofence. We use a PendingIntent object to call a IntentService that will handle the GeofenceEvent. The startGeofence() method is responsible for starting the geofencing process in the MainActivity class. We can now finally create the GeofenceTrasitionService.class mentioned earlier. This class extends IntentService and is responsible for handling the GeofencingEvent. First, we get this event from the received intent. We then check if the kind of geofencing transition that took place is of interest to us. If it is, we retrieve a list of the triggered geofences and create a notification with the appropriate actions. Following is full code of IntentService. The device port is shown in the virtual device window. The device port is usually equal to 5554. It is possible that you need to authorize this connection using your auth_token, but the command line shows you where it is located. Navigate to that location and copy the token and type, auth [YOUR_AUTH_TOKEN]. Testing geofences on a physical device is best, but if need be, you can run the app on the Android emulator. Doing so requires an emulator setup with Google Play Services installed. Go to Settings > Location in your emulator. Tap on Mode on Lollipop this is near the top of the list. Set the mode to set to Device Only, then set the mode to any other option, such as High accuracy. Tap Agree on the "Use Google’s location service?"" popup. This should remove the error you received when adding geofences in the emulator.